It does make us sad to see all the waste generated as we move from CRT monitors and televisions to flat panel offerings. Here’s a way to cut down just a bit on how much is going to waste. [Denizpa] turned a CRT monitor into a planter. The project is very straight-forward. First remove the plastic body from the electronic guts. Next you’ll want to choose your paint colors. While you’re at the home store, pick up a sanding sponge as well. [Denizpa] used 320 grit to sand all of the outside surfaces to help ensure the paint would bond well. 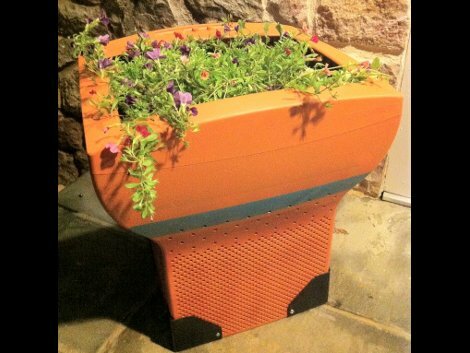 Once the paint dried four plastic corner brackets were screwed in place to add some interest to the bottom of the planter. It’s not quite time to plant though, there’s way too many holes in the case to just fill it up with soil. A black plastic garbage bag serves as a liner and completes the project. No mention on what to do with the guts you removed. If you have an idea let us know in the comments section. I’ve seen variations of it. I suggest punching a few holes in the garbage bag for drainage or you’ll have stinky soil. You can also tape a piece of plastic on the inside of the case to cover some holes and use the rest for drainage. Credit goes to Nicholas Gurewitch of Perry Bible Fellowship fame. Use the tube as a basic o-scope, trimming off and repurposing the remaining and superfluous bits as appropriate. If things are really hosed, start ‘circuit bending’ and try not to fry yourself. The sick thing is is that I know that was a SunMicrosystems monitor. What I’ve done with my old CRT circuit boards: remove parts, test them, put them in parts bins. You can always reuse the parts for projects. With so many cheap LCDs I do NOT want any “active” CRTs around the house. Too much power wasted for the task of displaying something. Put the tube on ebay or wherever they pay something for it. Agreed. There’s a beefy, well designed PSU full of much better capacitors and semis than you would find in a typical PC ATX PSU. Switches and LEDs. And transformer ferrites and wire if you can be bothered to unwind them. The tubes are only really fit for grinding up though sadly. Hey, recycling glass is not bad, but unfortunately not much else to do with them as you said. You can use the flyback transformer in the CRT to build various cool high voltage projects, from small tesla coils to marx generators. [Word of Warning]: High Voltages are dangerous. Be sure to read up on safety guidelines before attemping to work with voltages generated by a CRT Flyback Generator. Different strokes for different folks. Personally for myself this isn’t worth the can of paint, not to mention the cost of the brackets use for the feet. I do have a shed of old monitors & TV for me to scrap to add to my copper & lead piles. I plan to use the cabinets as a way to transport the CRT to the hazardous waste building at the landfill. They could also be use as a way to help protect a CRT during shipping if there’s a market for them. The degaussing coil can be made into a service degaussing coil, but when you get one, you have what you need. Perhaps those large coils can be used fore wireless power transfer or other experiments? I really wish there were a good use for the giant glass tubes in CRTs. Let’s brainstorm for a moment. You could open the tube (you know, drill a tiny hole in the back of it) and use the sucking power of the vacuum to give some other container low pressure. Or crush cans, idk. The phosphor on the screen could be washed off by swirling sand or salt and water in there like djpc said, then that solution could be recollected for experiments. I guess the lead paint could come off with paint thinner and patience, but even I wouldn’t want to do that. If it can just be covered up with several layers of paint that doesn’t chip so the glass can be used safely for other things that’d probably be fine. The CRT is leaded glass. The lead can leach out into the environment if the CRT is dumped into a ditch or elsewhere. What is leaded glass good for? I thought leaded glass was chemically stable. They still use leaded glass in fine crystal. If the electron gun assembly could be removed intact with the glass envelope it could be joined to a vacuum system for ionization or electron beam experiments. No mods, just stripped out. so many good ideas, i’d say purchase a UV LED and point it at the phosphor! it gloes!